I found myself in Virginia Beach this past week visiting the local university that my son will attend in the fall. In typical college fashion, I skipped out on a few of the required lectures and found myself wandering around right off campus looking for some non-cafeteria food! I walked across Indian River Road to a little strip mall and ALMOST went to the Waffle House. But, before I committed to being “scattered, smothered, and covered”, I scouted the other establishments in the complex. 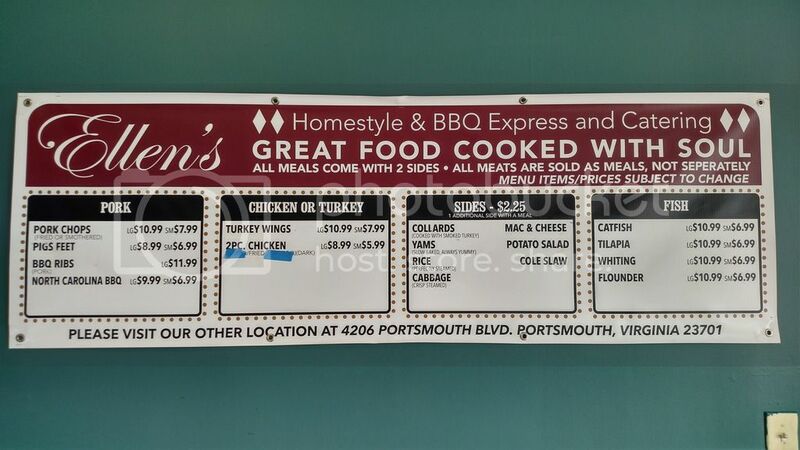 Ellen’s Homestyle & BBQ in Virginia Beach, VA.
Now, I am always on board for some delicious Waffle House food, but I am thankful I kept on moving. 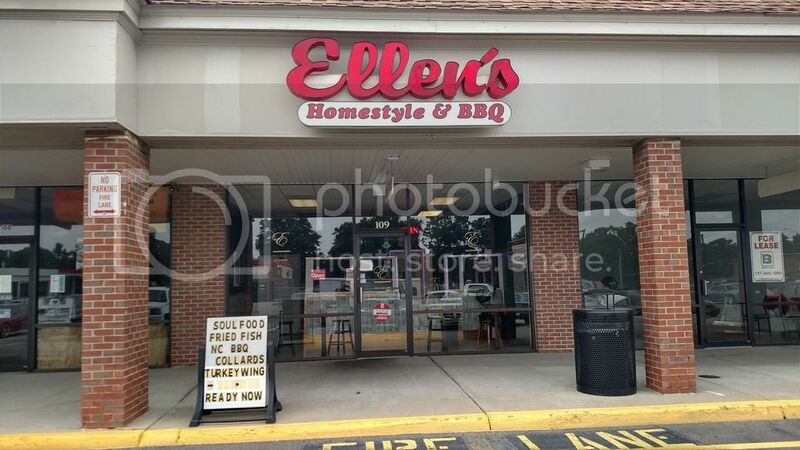 Right in the middle of the strip mall, surrounded by barber shops and e-cig stores, was “Ellen’s Homestyle & BBQ”. Now, I am immediately suspicious of a BBQ place in a strip mall, but I need to constantly remind myself that all great BBQ isn’t necessarily cooked in a ramshackle hut on the outskirts of the city limits. There is the possibility that good food can be in a strip mall. I was about to find out! When I try a new BBQ place, I don’t like to ask any questions about the menu or the preparation process. I just want to be friendly, check out the menu, order, eat, and see how I like everything. An initial positive for Ellen’s was the friendly service. A beautiful, left-handed young lady greeted me and proceeded to take my order. Great customer service can’t be overestimated from a business standpoint or from the customer’s perspective. I can report that Ellen’s met the customer service gold standard on my visit! Before I placed my order I had to decide what I was going to select from the menu. My preferred item at a new BBQ place is usually pulled pork. But a couple of things kept me from going my normal route on this visit. Number one, I didn’t see a smoker. I’m not saying the meat is cooked in any other fashion, but I prefer to see the smoker and smell the wood burning. It’s gets me in a pulled pork mindset. Number two, the menu said, “North Carolina BBQ”. To me, “North Carolina BBQ” implies that coleslaw is somehow involved in the dish. As much as I love all things BBQ, I have an aversion to coleslaw that I could never conquer. Mind you, I didn’t ask if there was coleslaw on the BBQ or if the meat was cooked in a smoker. I simply looked at the menu, took in the surroundings, and made my best guess. As I stated previously, I don’t want to ask a lot of questions about the food or the method used for preparation. I want to inspect the location, read the menu, and make my decision based on that alone. So, maybe I missed some killer pulled pork, but the threat of coleslaw made me go another direction and choose fried catfish as my entrée of the day. With my catfish order, I was able to select two sides off of the menu. I went with mac-n-cheese (as always) and I took a chance and ordered the greens. Well, they are called “Collards” on the menu, but we all know they are “greens”. I say “took a chance” because not every place can properly make greens. I was feeling lucky so I placed my order and hoped for the best. More on the greens soon. Even though I ordered the small catfish dinner, I was pleasantly surprised when I received my food. Two large pieces of fried catfish and two generous helpings of my chosen sides. Without even tasting the food, I am already pleased with this visit! Great customer service and the “money spent to serving size ratio” was in my favor. I decided to eat in the dining area of Ellen’s because it was nice and cool. I didn’t want to carry my food through the hot summer Virginia weather back to campus and then search for an air conditioned spot to eat. There were plenty of hot sauces, bottles of vinegar, and BBQ sauces available for my food, but my goal is to always taste the food and not bury it in add-ons. I enjoy hot sauce as much as the next person, but how does the fish taste? That’s what I want to discover when I am out and experimenting. 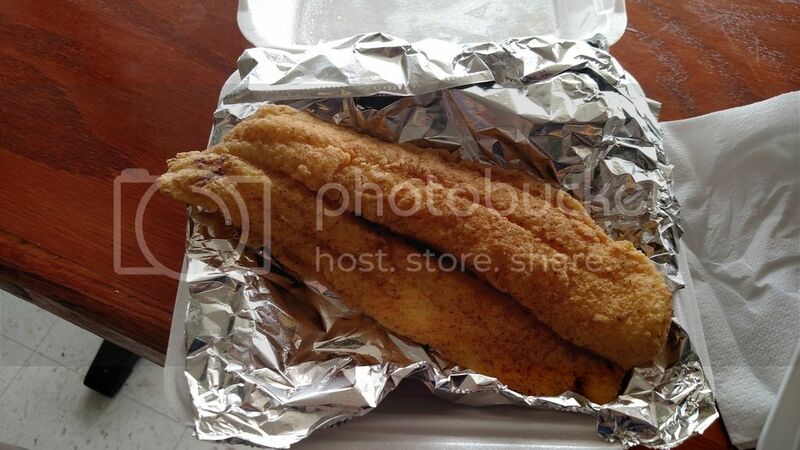 This catfish, from a strip mall BBQ spot, was immediately catapulted into my Top 3 catfish experiences of all time. I grew up catching, cleaning, and frying catfish. I’ve had catfish fried a hundred different ways. This catfish was simply amazing. It was seasoned to perfection with, I am speculating, some type of lemon-pepper combination. 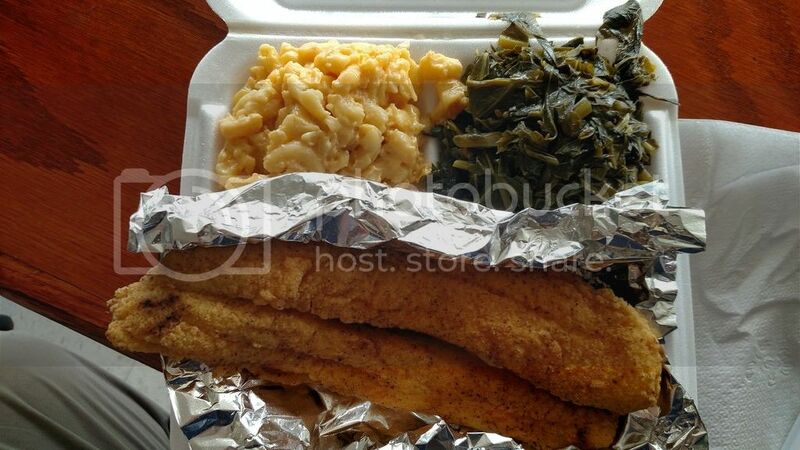 Two large pieces of catfish fried to an ideal golden brown on the outside, while on the inside awaits the hot, tender, delicious payoff. After I was amazed by the catfish, I moved on to the sides. In my mind, I am a mac-n-cheese connoisseur. I am always excited to try new mac-n-cheese and see how it ranks against other experiences. Ellen’s mac-n-cheese was a solid entry into my mac-n-cheese chronicles. This mac-n-cheese was thick and hearty and it had a very specific “cheesy” taste, which I enjoyed, but could not identify. I want to say it was a very Velveeta-y taste, but my palate is not that accurate! This was a quality side that would entice me to return to Ellen’s asap. My second side was the Collards, or “greens” as they will be referred to for the rest of eternity. I was hesitant to order the greens because they are one of my favorite foods and it ruins the rest of my day if I eat them and they are an inferior offering. What you are about to read is the God’s honest truth and it was such an experience I was instantly homesick for my hometown and plan to return home for the 4th of July. All because of these greens! I grew up in a small town in Alabama where the dominant landmark was a man-made lake and all the associated rivers, creeks, and streams. For a few years, in my early teens, we lived with my step-dad outside of the city limits in his junky trailer. But, it was a junky trailer right on the water and I loved being there. Our neighbors had a nicer trailer that was built up to look like a house and had a great screened in back porch that faced the lake. The neighbors’ grandsons became my best friends and we spent every waking hour together playing in the woods, swimming in the lake, or working in their grandparents’ garden; planting, weeding, and picking fruit and vegetables. It was the best few years you could ever have as a kid. After a long day of picking peas, we would drag the TV and VCR to the back porch to enjoy the night air as we settled in to shell the day’s pea harvest. 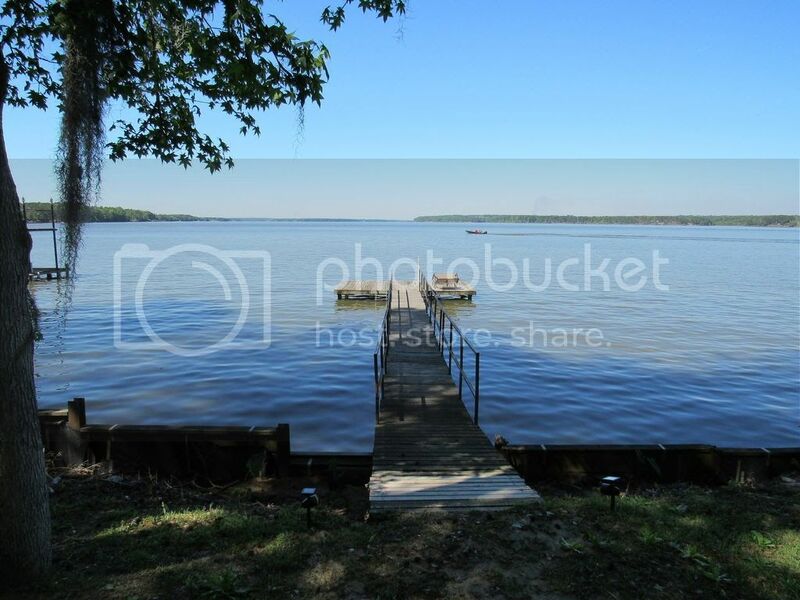 We would sit on the porch, which offered a tranquil view of the lake, and shell all the peas into 5-gallon buckets. All the while, the latest Wrestlemania video, which we rented from the local bait shop, would be playing on the television. Life was GREAT! After supper, we stayed up all night to talk about the girls we loved, watch the boats motor up and down the lake, listen to the bug zapper, and then eventually we would fall asleep out on the porch. When we woke up the next morning, we ate a hearty breakfast, and we would do it all over again. Playing, swimming, and working in the garden was our way of life. Those idyllic days were always followed by another night with a home cooked meal and ALWAYS with the greens. After ending the call with my momma, I savored every single remaining bite of those greens. The only reason I didn’t get another batch for the road was because I had to compose myself and return to the university and resume being a parent. It’s an interesting phenomenon how a song or a smell or the taste of properly prepared southern cooking can completely transport you to another place, another time, and seemingly another life. I finished up my meal, drank my Coca-Cola Classic, snapped a few pictures of Ellen’s setup, dried my eyes, and went back to where I was supposed to be all morning. But, if my son goes to this particular school, I know I will be back to Ellen’s as often as I come to visit. It’s a strange feeling experiencing such powerful nostalgia from a place you’ve never visited! The greens, in case you couldn’t tell, were fantastic. Ellen’s was my best dining experience in quite some time. And to think, I almost went to Waffle House instead of looking around for something new and interesting. 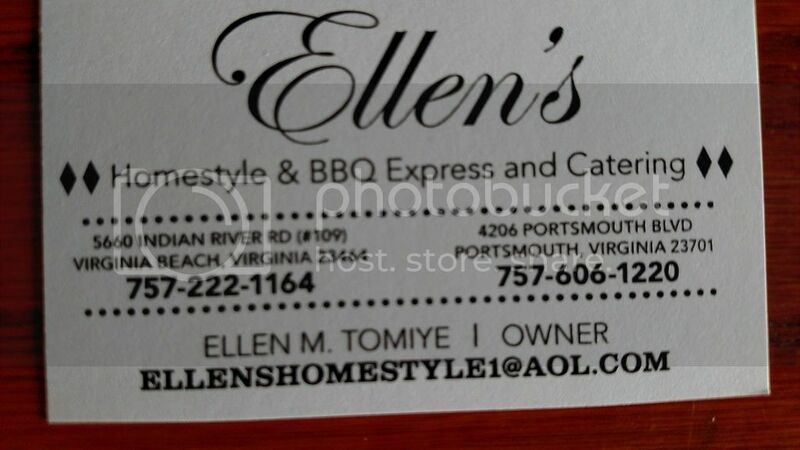 Contact Ellen’s for your Catering Needs! Before I end this rather lengthy blog post, I have to mention something else about Ellen’s. There was a newspaper clipping on the wall and I took a quick picture of it so I could go online and try to find it and read it when I returned to campus. All I can say is WOW!! What an interesting sequence of events that led to this bbq joint becoming a reality. Click here to read the article, written by Lia Russell. Ellen has been through some serious stuff and is now a highly successful entrepreneur. I wish I opened up a bit and asked to speak to her while I was waiting on my food, as it would have been an honor to chat with her about life and BBQ. Ellen’s story is incredible and this blog is, at its core, about people who have a goal and take ACTION to make it a reality. Ellen Tomiye is the embodiment of that spirit and I salute her amazing achievements……and her delicious food!! I want to start off by saying thank you from the very bottom of my heart. I am crying right now as I write this. Could you call me when you get the time. Thank you for the delicious food, amazing service, and amazing story! My son will start at Regent in a few weeks and we will be visiting you OFTEN! Have a great and wonderful day!! The food is delicious! The portions are extra large!! The prices are reasonable!! I love Ellen’s Homestyle!! I love Ellen!! 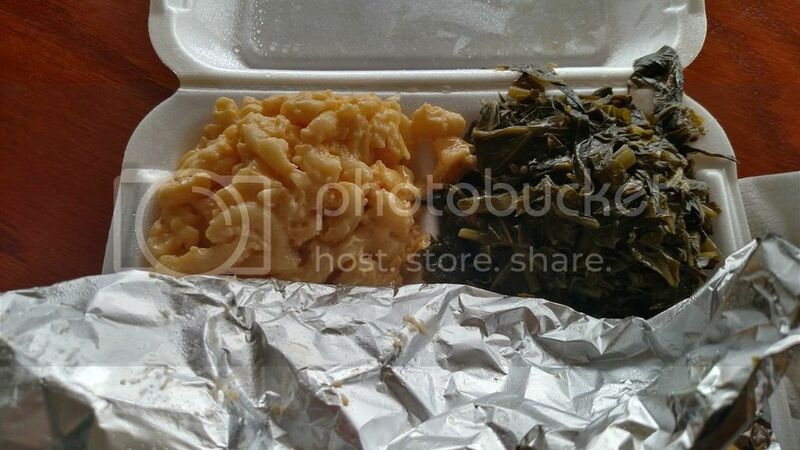 If you want a delicious home cooked soul food meal, Ellen’s Homestyle is the place to go. And it won’t break you.